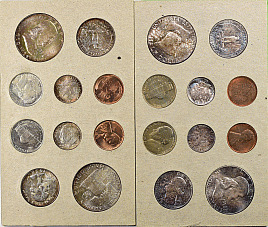 Also referred to as a 'Double Mint Set' which has two examples of each coin struck for circulation (P and D Mintmarks). Toning noted. Inner plain brown envelope is not included, however the original outer mailing envelope is included. Description: Also referred to as a 'Double Mint Set' which has two examples of each coin struck for circulation (P and D Mintmarks). Toning noted. Inner plain brown envelope is not included, however the original outer mailing envelope is included.